In a time and place where unprecedented numbers of small farmers are going under every year, a new book profiles eight small farmers who are using a blend of creativity and market research to craft a niche for themselves in difficult economic conditions. 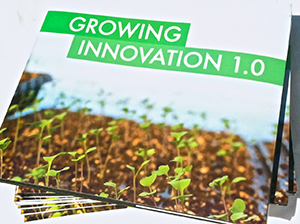 Published by the Rural Advancement Foundation International (RAFI) Growing Innovation 1.0 reveals a thriving subculture of small farmers who continue to defy the trends of industrial agriculture. Through a series of short vignettes showcasing the work of eight very different operations, the reader gains insight into goat-raising operations, small dairies, orchards and row crop farming. All of the farms are in North Carolina, where RAFI is based. The organization is a nonprofit that aids and advocates for “thriving, socially just, and environmentally sound family farms” in North Carolina. One of their main projects, the Tobacco Communities Reinvestment Fund, supports innovation to help communities move away from dependence on tobacco as a crop. This program has been supported by a grant from the NC Tobacco Trust Fund Commission since 2002. RAFI is currently working with more than 20 farms, providing seed capital and consultation, according to Jean Willoughby, Project Director of RAFI’s Agricultural Reinvestment Fund. Many of these rural farmers grew up surrounded by conventional agricultural practices, in areas where tobacco was one of the primary crops. Tobacco sales in the U.S. have dramatically decreased over the past fifty years, leading thousands of North Carolina tobacco farms to go under. Add to that economic conditions that make staying out of the red difficult for any type of small farm, and the odds don’t look so good for North Carolina’s family farms. To make it in today’s market, small farmers like the ones featured in Growing Innovation 1.0 make creative use of value-added products like cheese and jam, or change infrastructure and methods to streamline their operations. Some farmers use their deep knowledge of their communities to find out what the local market wants, and how their operations can best serve them. Jay Dixon expanded his clientele by investing in a portable EBT reader, so he could deliver to community members who rely on SNAP. Another farmer, Felix Vargas, grows traditional Mexican crops like jicama and chayote for a Latino community that previously only had access to imported varieties of these products. In the end, RAFI endeavored to highlight farmers who were not only finding creative ways to increase their efficiency or product value, but whose ideas also offer a practical way forward for neighboring small farmers. Sharing these powerful stories spreads knowledge, a key aspect of RAFI’s work. “We are hoping to raise all boats,” says Willoughby. She notes that some farmers hesitate to share their the secrets to their success with competitors. For this reason, every RAFI beneficiary is asked to hold an outreach event to share what they have learned with the farming community. In the context of the larger project, the power of storytelling lies in spreading technical knowledge, ideas, and—just as importantly— the potential to inspire resiliency in farmers as they see how their peers thrive in the face of challenges. So far, the book has been warmly received. RAFI has registered hundreds of downloads of the online edition. Despite the success, they have considered further lowering the price to increase accessibility and further spread knowledge about ways small farmers can do business. The goal of this release, according to Willoughby, is partially to “test the waters and see if the general public would be interested in this sort of thing.” RAFI has worked with many innovative farmers. Some of those stories are available on their website and with luck, more will make their way into an expanded publication in the future.